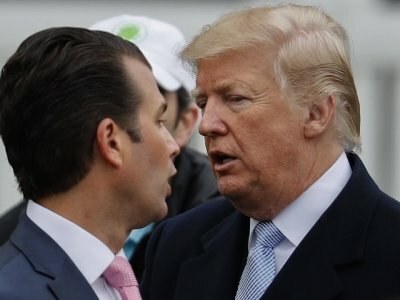 WASHINGTON (AP) — Questioned intently by a Senate committee, President Donald Trump’s son struck a firmly unapologetic tone, deflected many queries and said he didn’t think there was anything wrong with meeting a Russian lawyer at Trump Tower in hopes of election-season dirt on Hillary Clinton, according to transcripts released Wednesday. “I don’t know that it alarmed me, but I like I said, I don’t know and I don’t know that I was all that focused on it at the time,” Trump Jr. said in response to a question about whether he was troubled by the prospect of Russian support, the transcripts show. The committee on Wednesday released about 2,500 pages of interview transcripts and other documents tied to the New York meeting, which Trump Jr. attended with the expectation of receiving compromising information about his father’s Democratic opponent. The transcripts reveal some new details about how the meeting — a key point of interest in special counsel Robert Mueller’s investigation into potential coordination between Russia and the Trump campaign — came to be arranged and efforts afterward to mitigate the political damage arising from its disclosure. They also show the disappointment of Trump Jr. and other campaign figures, including brother-in-law Jared Kushner and campaign chairman Paul Manafort, when the meeting failed to yield the harmful Clinton information they thought they’d get — as well as the increasing panic of one of the meeting participants who feared his reputation would be ruined by his role in setting it up. Trump Jr. issued a statement Wednesday pronouncing himself candid and forthright with the committee, but the transcripts show that he responded time and again to questions by saying he could not recall or had no idea. He answered “No, I don’t recall” when asked if he had spoken with his father about the Russia investigation. He also did not remember the attendance at the meeting of a Russian-American lobbyist who — in a quirky sartorial detail revealed in the transcripts — was wearing pink jeans and a pink T-shirt that day. Trump Jr. spoke by phone several days before the meeting took place with a caller with a blocked number, but said he didn’t recall who the person was and didn’t know if his father used a blocked number. He told the committee that he didn’t alert his father to the meeting beforehand. Both the House and Senate intelligence panels have produced reports on their own Russia investigations. But Senate Judiciary Committee Chairman Chuck Grassley announced in January that he wanted to release transcripts from his committee’s interviews because people “deserve to have all the facts, not just one side of this story.” Senate Judiciary Democrats said the transcripts are just “one piece of a much larger puzzle” and do not tell the entire story because some meeting participants were not interviewed or subpoenaed. “I’m a music publicist. Politics, I knew nothing about,” Goldstone said, adding that neither did Emin Agalarov nor Agalarov’s father, Aras.